Discover all of the events and offers we have in Mondrian Doha throughout March! There's plenty of activities coming up in Mondrian Doha during March, read on as we tell you more! We’re celebrating International Women’s Day at CUT on March 8th with a 15% discount for all women and a complimentary flower for each lady. Double your joy on International Day of Happiness, enjoy one meal and get another free at CUT! It’s time to treat your Mom at CUT this Mother’s Day. Enjoy a 3-course set lunch menu and your Mom will be treated to a beautiful bouquet of flowers. It’s all about the ladies at Morimoto on March 8th. 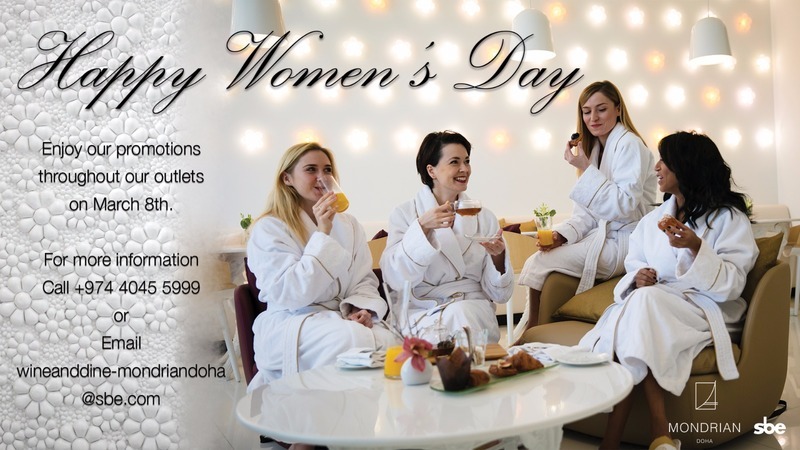 Celebrate International Women’s Day with a 15% discount for all women, including a complimentary flower. Enjoy a 5-course lunch whilst learning how to make sushi rolls with none other than Iron Chef Morimoto! Call +974 4045 5999 or email wineanddine-mondriandoha@sbe.com to book. Thank your Mom for all she does this Mother’s Day with a special 3-course set dinner menu and a bouquet of flowers at Morimoto! Celebrate this years ‘Sakura’ at Morimoto! From the 20th to 24th of March, we’ll have specially themed delicacies and cocktails available to mark this wonderful time of year. Enjoy a laid-back International Women’s Day with friends at Hudson Tavern. We have a 15% discount for all women, including a complementary flower. Celebrate the Emerald Isle this St. Patrick’s Day at Hudson Tavern. Grab a Guinness burger, a half yard and enjoy the Irish band playing jigs and reels. You’ll feel as if you’re sitting in Dublin! To mark the happiest day of the year, we’re giving you double happiness with a ‘buy one get one free’ offer at Hudson Tavern! Moms are pretty special, so we think they deserve their meal for free at least once a year! Check out our special set menu for moms and dine for free this Mother’s Day! Grab your besties and stay happy all night at Rise this International Day of Happiness. Special happy treats and all-night happy hour awaits! 50% discount on selected drinks. Indulge in delectable treats this International Women’s day at Magnolia Bakery. Each lady will receive a 15% discount and a special flower. What can make you happier than sweet treats, coffee and tea? Celebrate International Day of Happiness with buy 1 get the 2nd free at Magnolia Bakery! Spoil your Mom with something sweet this Mother’s Day at Magnolia Bakery and enjoy a special sweet and drinks menu. Book a Mondrian Moment treatment and receive 30% off all retail products. Call +974 4045 5550 or click here to book your appointment now! Share your full ESPA experience together with a friend and enjoy 30% off your next appointment. Become the fittest version of yourself this March! Buy a one month membership in the gym and get the second month free!